Get moHeart, moHumour & moHappiness at momondays! May 6, 2019 will be one of the most exciting moShows EVER!!!! I hope you join me in the resurrection of momondays in Barrie! There are all kinds of networking events where you can connect with people on a professional level. There are dozens of events where you can 'get into the minds' of brilliant experts on countless subjects. But how many opportunities do we have to truly connect with each other on the human to human level? Come at 6 to give yourself time to connect with some of the nicest people ! An interesting thing happens when you come to momondays for the pre-show socializing and networking. 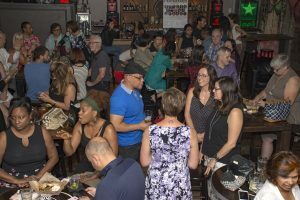 While the purpose of the show is not business, some of the best business connections have come out of a meeting at momondays. Come on a roller coaster ride of life, laughter and music! RELATIVITY of TIME: Jason has been practicing mindfulness and meditation for over 20 years and uses his shifted perspective of the world to help others. After his own corporate burnout, Jason has traveled the world, expanded his knowledge and now helps others through Keynote Speaking, Life Coaching, and Stress Management Consulting. MariaMichelle’lee is a sought after Inspirational Speaker who fully embraces the power of story to motivate, inspire and transform the lives of others. Combining her personal life experience, with over ten years of empowering others, Maria is known to boost women out of their self doubting beliefs, to step into greatness and challenge them to regain their power within. As a Mirror Work Coach, MariaMichell’lee is a powerhouse encouraging women to speak their truth from the inside out. When Maria is not traveling for work, you will find her enjoying family time with her husband, and their three amazing children. MY TWO LOST COINS: Rakesh was born in a poor, farmer family in India. At age 11, he attended a political rally & developed the fascination to become a speaker but he didn't know how to read, write & speak in English. He self-taught and migrated to Canada in 1999 and joined the Toastmasters some 8 years back & that changed everything for him & often he delivers his speech titled "Meet the Real SlumDog Billionaire". LET'S GET YOU ON THE RISE: With fear and self judgement being so evident, how do you actually just get past it? Shahab went from super shy guy who was terrified of meeting new people and pushing himself to new heights, to just embracing what life itself has to offer, and being present through everything that happens along the way. This isn't about how to meet people, but about being you, taking action, and being open. Keith is a creative writer and toastmaster who enjoys entertaining an audience with his stories. After a series of thought-provoking events, he developed the belief that soemone was watching over and looking after him. YOU MEET THE NICEST PEOPLE AT MOMONDAYS... NOW YOU CAN PARTY WITH THEM TOO! moTHANKS TO OUR SPONSORS AND PARTNERS! Want to speak at momondays Barrie? Jeff is the epitome of AMBITIOUS yet is a huge believer of BALANCE in life. After some extensive world travelling, he's made it his mission to explore his own backyard and impact the lives of the people in his own community. You can find Jeff out on the lake teaching dragon boating for charity festivals or for corporate team building events. He hosts a travelling podcast on Youtube called, "VicariousDiaries" with plenty of inspirational videos. Lesson #1: Create a fun nickname as it is a huge help to being remembered. In his free time he enjoys writing music with the guitar, practicing singing and learning about plant based cooking. "There is definitely not a shortage of inspirational or educational content out there; through social media, books or the web...but there is definitely a shortage of human connection. Come, share your voice and enjoy a unique form of art; the art of a story." Check out the heart, humour and happiness at momondays Barrie!